When managing commissions, Paperless Pipeline will display agents’ year-to-date production numbers and other commission-related information. Click "Update Commissions" from the left menu of a transaction. Complete the information until you reach the “Broker / Agent Commission disbursement” section. Click in the agent box to view the agent’s year-to-date production amounts and other commission-related information. The production amounts will be based on the agent’s start date anniversary, or if the agent doesn’t have a start date specified, the totals will be based on calendar year. 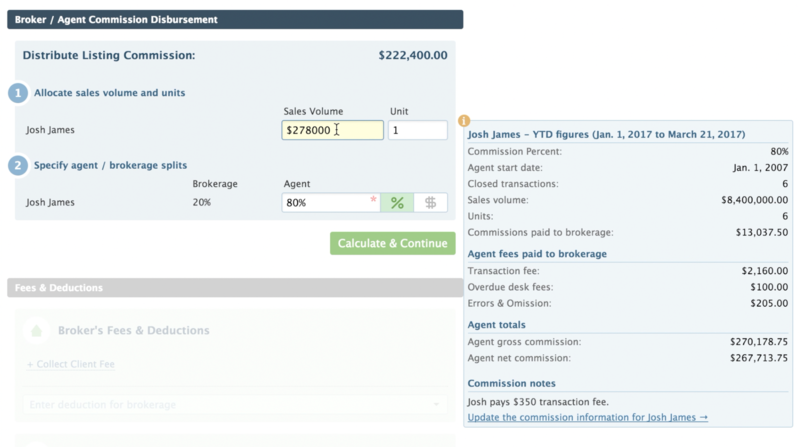 The “Commission notes” section will display commission notes from that agent’s user profile. Click “Update commission info” to be taken to the agent’s profile where you can update the agent’s split or other commission information. Changing information in the Commission Notes section will trigger an email to be sent to admins reminding them to check that agent’s pending transactions to determine if you need to update any commissions.